Halogen Headlights are very popular and most widely found in cars today. Halogens or the halogen elements are a group of 5 chemically related and toxic elements. They consist of Fluorine (F), Chlorine (Cl), Bromine (Br), Iodine (I), and Astatine (At), all highly reactive elements. Each halogen bulb has a thin tungsten filament encased in a glass capsule filled with halogen gas which regenerates the filament each time the headlight is turned on. Halogen headlamps emit a bright, white light have a relatively long lifespan and a fairly low replacement cost, making them a popular choice of headlight for your car. 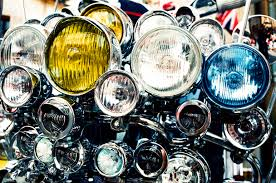 Xenon Headlights, often referred to as HID (high intensity discharge) are found in some of the newer models of vehicles today. Xenon is a colorless, odorless gas that, unlike halogen, is unreactive. The xenon bulb emits a clean, bright white light that provides excellent illumination. It is more efficient compared to halogen in that it uses less power and has a longer life span. HID headlights are more expensive and may cause a harsh glare to oncoming drivers due to its bright intensity. LED Headlights, or Light Emitting Diodes, are another efficient lighting choice. This semiconductor diode gives off light when voltage is applied. LED lights require little power to illuminate and overall consume very little energy. They do generate heat and require more cooling than do HID or Halogen lamps. However, due to their efficient energy consumption they are becoming a popular choice in many types of lighting beside headlights. If you have any questions about the best headlights for your car, consult the knowledgeable staff at the Olympia Auto Mall. Located just off Highway 101 at the Cooper Point Road-Auto Mall Drive Exit, they are your source for new and used cars in Tacoma, Olympia, and Puyallup.